Everton have completed the signing of 17-year-old forward Matthew Kennedy from Kilmarnock for what the Goodison club describe as "a nominal fee". The Ayrshire club had previously rejected a series of offers, the latest believed to be a six-figure sum. But the teenager, who had also been watched by Chelsea and Sunderland, has signed a three-year contract after a fee was agreed between the clubs. Manager Kenny Shiels had described Everton's bid as "derisory". And he suggested was "disrespectful to the club and unsettled the player, which I wasn't happy about". Shiels hoped that Everton would not increase their offer for the forward who made his debut last year and has made 14 appearances for the Rugby Park side. 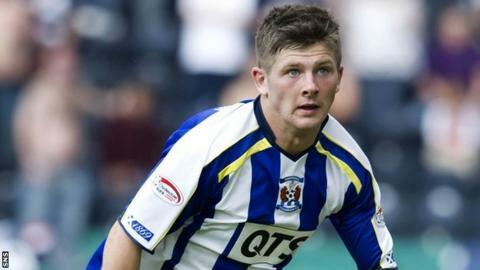 Kilmarnock chairman Michael Johnston also suggested that it would be better for Kennedy to remain with the Scottish Premier League club for his own development as a player. Johnston said that Shiels is assessing some trialists ahead of Friday's transfer deadline, with all of the players from overseas. Shiels, who expects hamstring injury victim Jeroen Tesselaar to be missing for six weeks, says he finds reports of possible Rangers' interest in Killie goalkeeper Cammy Bell "hard to believe". "It is a bit late, isn't it? There's not been a thing," he said. "If they were wanting him you would have thought it would have happened maybe a week ago, but I can't see it happening now."